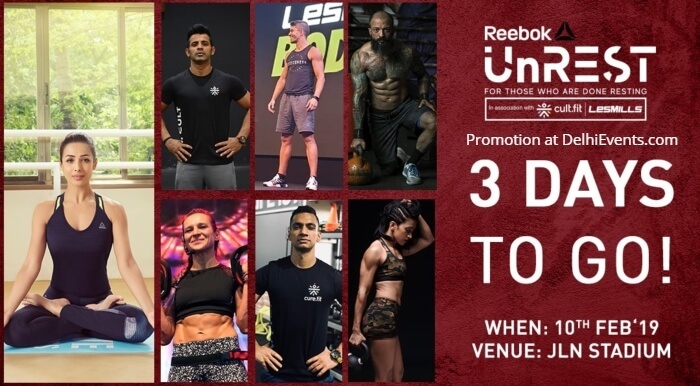 Event Description : After taking Mumbai and Bangalore by a storm, Reebok UnREST is back to Stir up a fitness revolution, this time in the capital city, New Delhi. Reebok UnREST, in association with Cult.fit and les Mills, the festival calls upon the city’s active fitness enthusiasts to participate in a range of exciting sessions including Yoga, Functional fitness, Boxing, Dance Fitness, Strength &amp; Conditioning. Ensuring an exhilarating workout, the festival will witness the diva herself, Malaika Arora! Yes! fitness freaks, Malaika Arora who is fashionably fit ambassador for Reebok India will conduct an exhilarating power packed 30 minutes of Yoga with her team of master trainers. Get ready for a high intensity Functional Training Challenge with famed CrossFit coach - Shivoham. The power packed fitness CULT dance session by Shwetambari Shetty, strength and conditioning workshop by Cult trainer Rishabh Telang, followed by a Boxing session by Cult trainer Kamal Mujtaba. Adding to this will be Les Mills trainer Denisa Alexandru who will conduct a special Body Balance workshop for the attendees. Taking the tempo higher, participants will also get the chance to engage in GRIT Cardio and Combat session with Less Mill trainers Denisa Alexandru and Fernando Andrade. We got call for confirmation and been asked to reach at 2.30pm for hand badges collection. Right now we are at venue like many others but not getting any information about car parking and all. Is this event going to happen or not ? Don't have any contact number also where I can call for enquiry and nobody here giving any information at gate number 14.
sorry to hear that. will be careful next time with their events.